From the Mouth of a B.A.T. Like a message in a bottle, the following email arrived in my inbox just the other day. 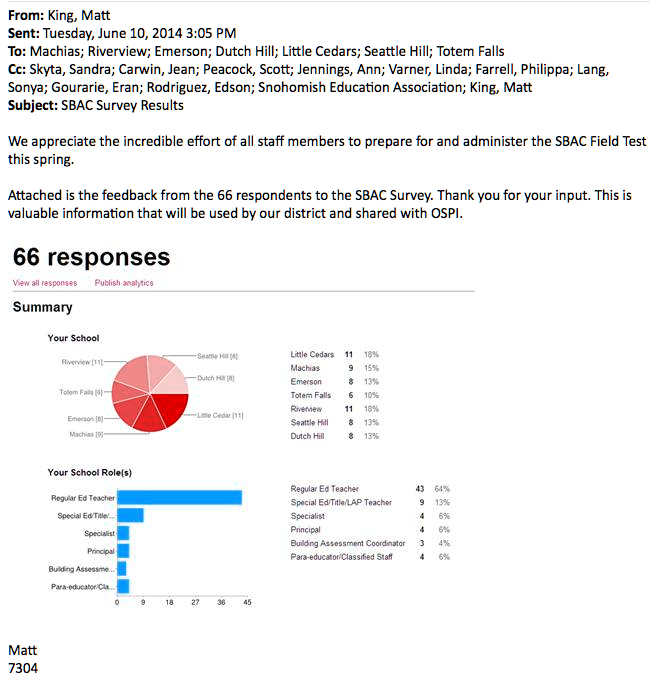 It is the Snohomish School District (Snohomish, WA) collection of teacher responses to their survey concerning the recent SBAC Field Tests. As I read the full report, which is attached here, I began to consider ways that this limited anecdotal document might inform future decisions on testing and instruction. First, the willingness of this district to share this information with teachers is laudable. It should be common practice, of course, and my comment is meant to recognize that openness is a necessary practice to assure that the terms “public” and “education” continue to have a meaningful relationship. Far too much secrecy has surrounded the creation of the Common Core State Standards, the PARCC and the SBAC tests for the public to be confident in either instrument or the people behind it. While the bar graph provided in the district document indicates a relative balance between frustration and satisfaction, the anecdotal evidence weighs heavily to the former. Lengthy, complex directions were cited numerous times; difficulty with technology and various online test tools was also a major theme. These kinds of issues are “glitches,” to be expected and worked out, according to Wilhoft. What would be necessary to “work out” these problems? Developmental appropriateness of directions would require attention to factors well known already to K-3 educators, including Dr. Wilhoft, who points to his time as a third grade teacher as a source of pride. Of course, for the directions−or the test itself−to be considered “age appropriate,” the standards themselves would have to be suitable to the learners. They are not. Technology issues require not only adjustments by the test creators, but also large and ongoing capital investments by school districts across the nation if the SBAC test is to become the gauge of academic attainment for American students. You simply can’t ignore the regular outlay of money the creators of these tests propose, driven not by a desire to enrich student learning, but to establish a culture of testing that perpetuates profits to testing companies and technology magnates. These expenses are unsustainable for many districts. The disruption of the educational environment due to the SBAC field test was extreme by any standard. 54% of teachers found the test to be “very disruptive,” with another 26% calling it “disruptive.” What brought on such damning statements? Lack of access to a limited number of computers for anything but testing was the main factor. Between SBAC and “EasyCBM” testing, it appears that some schools were unable to accommodate students from “…the middle of March” to sometime in May. In addition, educational assistants (EAs) were diverted from their normal duties in the classroom to test proctoring and technology trouble-shooting. When tests pre-empt instruction, the tail is wagging so hard that the dog is hardly recognizable. If standardized testing has a place in public education (a notion that I reject), then its validity is challenged when it compromises instruction. When EAs are not working to assist learning they are no longer EAs, they are wardens. To say that students generally disliked the tests is to sugarcoat the results. 40% of students considered the math test “negative” or “very negative.” Only 14% considered it “positive” or “very positive.” Results for the ELA test were nearly identical. Frustrations with technology, with long instructions, and with the formatting of questions highlighted the concerns in math. The ELA test contained long prompts and reading articles that challenged the readiness of many students. Keyboarding skills seemed a particular obstacle for many children. Teachers know that student attitudes toward difficult tasks can be extremely varied, and attempt to structure classroom experiences to limit frustrations that distract from active learning. 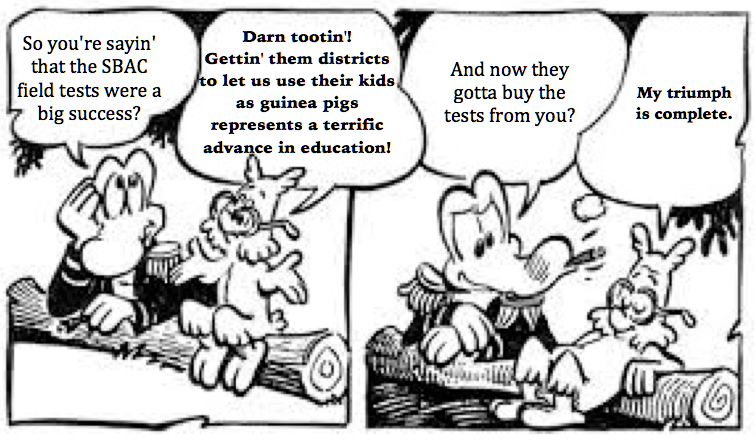 Here, however, the reactions indicate a significant disconnect between the test takers and the test makers. If a test has little meaning to a student, and if the activities of the test have only a limited relationship to what occurs in the classroom, it’s likely that students will find the testing experience awkward and unfriendly. While there are additional teacher comments on technology issues and various other concerns, I want to return to the statements that began this piece. Anyone spinning standardized tests as “huge successes” ought to carefully consider the data the Snohomish School District has provided. Jeff Nellhaus had a huge success in the sense that he was able to coerce school districts in the PARCC group into providing unpaid guinea pigs for norming a test according to standards that have never been validated. Beyond that accomplishment, any claim to success is smoke and mirrors, meant to preclude reasonable challenges. Joe Wilhoft ‘s statements about SBAC testing are likewise coded to conflate economic security and educational standardization. Any school, district, state official or U.S. Dept. of Education representative that claims they have the secrets students need “to thrive in our competitive global economy” is blowing some serious smoke, indeed. Decoded, this translates to, “Your student will emerge from this system a compliant individual, consumer and worker bee, ready to do what corporate structures deem vital to their survival.” The ideas of being educated and being employable are, and should remain, separate notions. The SBAC Field Test is a great failure due to the commitment to corporatized standardization it represents and sanctions. 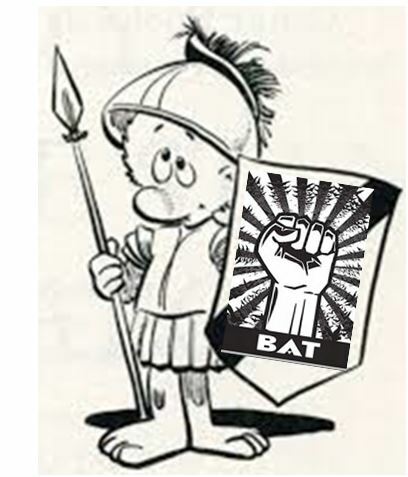 The creators of SBAC, PARCC and other instruments that are planned for the future ought to be drummed out of public education. I’m stuffing this message back in the bottle I got my original email in and I’m tossing it back in the Internet Ocean. I trust it will land on your shoreline and provoke conversations about better possibilities for educating students than either SBAC or PARCC represent. Out of the Cave Blog by David Sudmeier is licensed under a Creative Commons Attribution-NonCommercial 4.0 International License. Based on a work at http://davidsudmeier.com. Permissions beyond the scope of this license may be available at http://davidsudmeier.com/about-this-blog/.